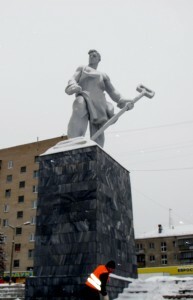 I’m in fabled Magnitogorsk, Stalin’s Steeltown USSR. The steel plant is truly vast, running for miles along the Asian bank of the Ural River. Some parts are old and decrepit looking, others appear sparkling and ultra-modern. On a snowy day like today, the plant is covered with a pall of smoke and steam, as hot smokestack gases hit the icy air. This was the mighty steel works that Stalin decreed should exploit the ores of the Magnetic Mountain, safely behind the Urals, far from any invader. In its heyday it was a symbol of Soviet industrialization, a vast new plant built from scratch in the middle of nowhere at enormous human cost. 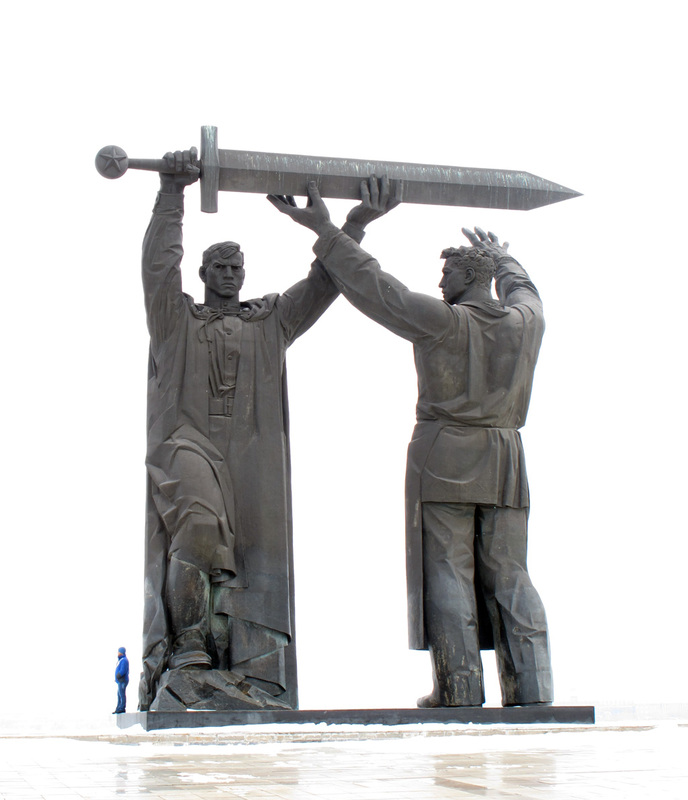 For detailed histories see Stephen Kotkin’s Magnetic Mountain: Stalinism as a Civilization, John Scott’s Behind the Urals, and Kotkin’s Steeltown USSR. Urals to the Front in Victory Park (53.407248,58.992398) is a giant WWII monument showing a steelworker handing an enormous sword to a Soviet soldier. 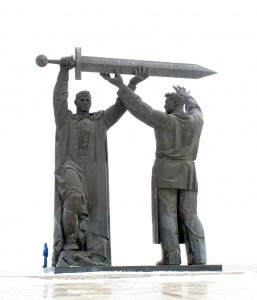 The monument is on the European bank of the Ural River and provides a good view over to the Steelworks on the Asian side. The Magnitogorsk Metallurgical Kombine Museum at Pushkin Prospkt 19 (53.394086,59.061326) (8-12 + 1-5) covers the history of the plant construction, its WWII contributions, and its more modern history. There are some small dioramas and a giant scale model of today’s steelworks. 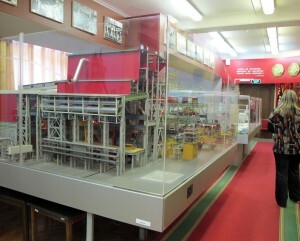 But pride of place is taken by several large models of the latest ultra-modern sections of the plant, with animated equipment and with moving lights or metal foil representing moving steel. The fine Local Lore Museum at Ul. 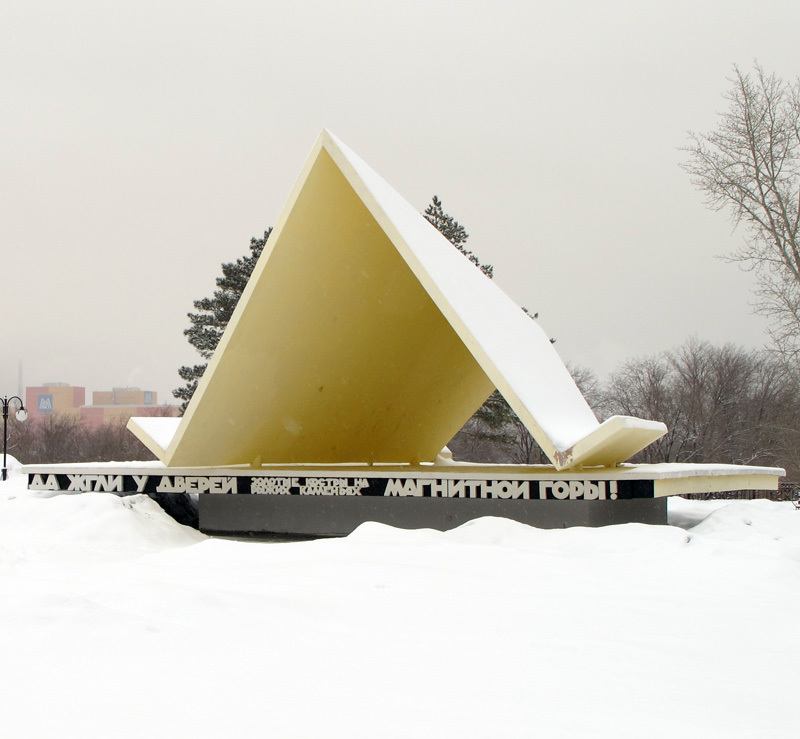 Soviet Army 51-A (53.392004,58.988903) is dedicated to the city’s history, from the Kazakh and Tsarist periods, through the crash industrialization era, and into the Soviet glory years. This includes a fine selection of Soviet posters exhorting steelworkers to new heroism. There is also a small City History Museum at Ul. 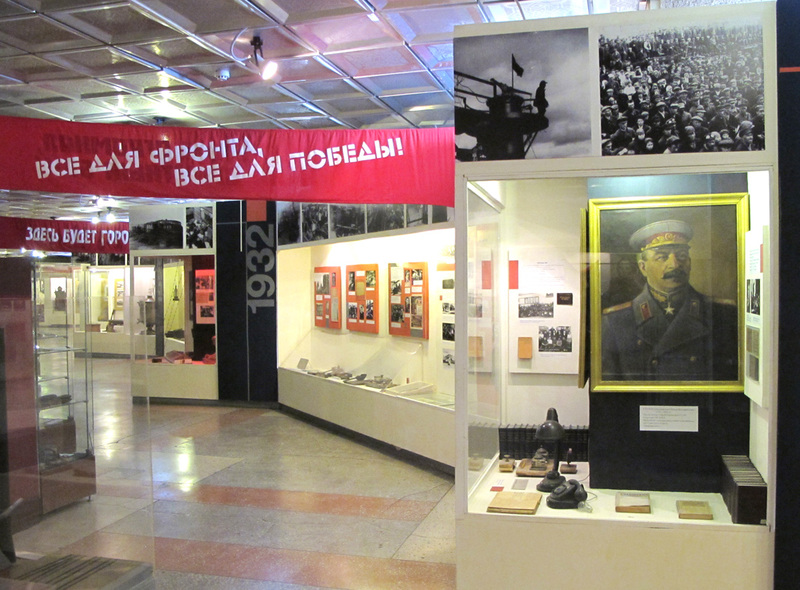 Soviet 145/3 (53.39584,58.963577) but that is mostly a subset of the MMK and Local Lore museums and can be skipped. 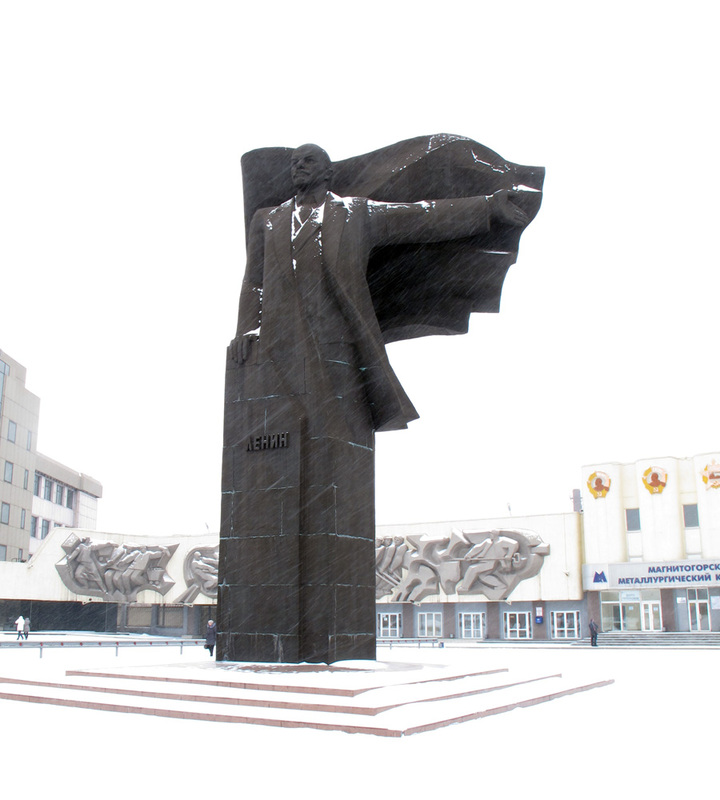 Two smaller monuments are the Tent Monument at 53.426009, 58.997673 commemorating the incredibly harsh initial living conditions in tents on the frozen steppes; and a Socialist Realism statue of a Heroic Steelworker at 53.437145, 58.981434, in front of the train station. There is a hilltop viewpoint at 53.385607, 59.055632 at the south end of Ul. Kirova, which provides good vistas over the factory area. The symbolic Factory Gates at 53.41524,59.05416 feature a blackened but resolute Lenin fronting a series of bas-reliefs of striving steelworkers. The statue of Stalin used to stand here. Practicalities: I stayed at the very pleasant Hotel Laguna at 9 Ul. Naberegnaya, which includes an indoor water park and a good sushi restaurant. I’d recommend Coffee House at 37 Pr. Lenina as a relaxing place to gorge on lattes, cakes and muffins. There are frequent buses (5 hrs) to and from Chelyabinsk. The main bus station (outside the train station) is a little confusing. There seem to be three competing bus companies, each with its own ticket office. They overlap on routes, but have separate schedules and separate departure areas. On departure make sure to check with one of the ticket controllers that you are waiting in the right place, and don’t just trust the signs! I mostly used the tram network to get around. Here’s a route map. Tram 4 runs from Ul Leningradsky on the West side across the Ural and past the MMK Museum. The city has a reputation as being heavily polluted, but I didn’t notice any particular problems in my short visit. Rather to my surprise, given the rather alarming appearance of the steel plant, the air at ground level seemed fresh and clean.